It’s no secret that I’m a huge fan of Spotify. I have already publicly defended it from an attack by Taylor Swift Why Taylor Swift Is Wrong About Spotify Why Taylor Swift Is Wrong About Spotify In the past week Taylor Swift has pulled her music from Spotify, inspired countless song-pun laden headlines and reignited the debate about streaming music services. Read More and a dissing by Adele Why Adele Is Wrong to Stop You Streaming Her New Album Why Adele Is Wrong to Stop You Streaming Her New Album Adele is refusing to let services such as Spotify and Apple Music stream her new album 25. Which is a boneheaded decision that's bad for her, her fans, and her record label. Read More , and championed the service to anyone who’ll listen. Despite the great free tier The End of Free Music: Should Spotify Make Everyone Pay? The End of Free Music: Should Spotify Make Everyone Pay? Apple is trying for another revolution with the rumored launch of Apple Music, a music streaming service. But along the way, Apple might be trying to kill existing free music streaming services. Boo! Hiss! Read More , I pay for Premium. This year I eagerly awaited Spotify’s Year in Music feature for 2015. This annual event breaks down the music you listened to over the last year, and it’s a lot of fun to look back and relive the soundtrack to your life. There is, however, a lot more that can be gleaned from the information Spotify provides with this feature. Let’s take a look at six things you can learn from Spotify’s Year in Music. Obviously this only applies to people who use Spotify, whether for free for just a few hours, or with a paid subscription for days on end. To see your own Year in Music, head over to Spotify’s dedicated site and log in. 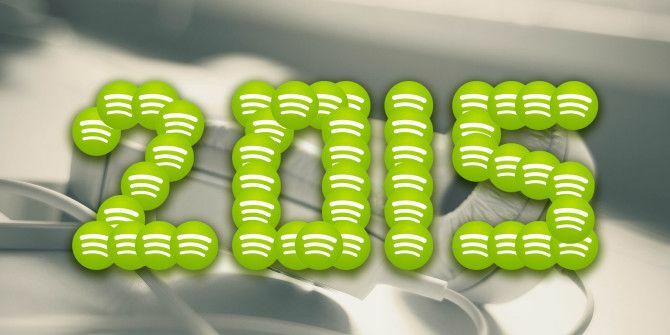 Scroll down to see a cool rundown of how you used Spotify in 2015. I’d also highly recommend grabbing your personal 2015 Top Tracks playlist. The most obvious thing you can learn from Spotify’s Year in Music is what you listened to over the past 12 months. I knew I had listened to You’re Gonna Go Far, Kid by The Offspring a lot but I didn’t realize it was my most played song with 73 streams. Similarly, I’m pretty embarrassed to see how far up my list of songs Nu Flow by Big Brovaz is. There was a few weeks where I listened to this song a lot, but even so, it’s pretty inexcusable. I’m also seeing the effect of Spotify’s awesome Discover Weekly playlist Discover New Music with Spotify's Automagic Playlists Discover New Music with Spotify's Automagic Playlists Spotify has recently released several new ways of generating unique playlists that will help you discover awesome new music. We're here to guide you through these automagic playlist makers. Read More . Not only did I listen to 1,590 artists this year, 30 percent more than in 2014, quite a few of the new ones I found using Spotify’s recommendations made it into my top 100 songs. My favorite statistic was finding out just how much I had used Spotify; apparently I listened to 49,000 minutes worth of music in 2015. That works out as 34 days, 820 hours, or over 10 percent of my waking life. For the past two years it’s been my only music library Spotify Your Music Collection: The End Of iTunes Spotify Your Music Collection: The End Of iTunes Spotify is no longer content to just compete with radio, now they're competing with the idea of even owning music. Read More but still, even I was surprised by how much I had actually used Spotify. Once you know how many minutes of Spotify you listened to you can do some fun things with the information. For starter, you can work out roughly what each song cost you if you’re a Premium subscriber. In Ireland, Spotify costs €10 a month so I paid €120 for the year. Assuming the average length of a track is around three-and-a-half minutes then I listened to 14,000 tracks (just under 40 a day) over the course of the year. That means each play cost me €0.0085. Interestingly, this is very close to Spotify’s royalty rate of between $0.005 and $0.008 per play. I suspect that I’m a very heavy user of Spotify so with the overheads I probably cost Spotify more money than they made from me. This is one of many situations where the vast majority of users support the far fewer heavy users. If you don’t use Spotify that much, you might be shocked at how much each play cost you. My editor actually canceled his subscription when he realized that he had only used Spotify for four hours through the whole of 2015; which equates to about $0.60 cent a track. With a bit of similar math you can also work out how much revenue you’re generating for your favorite bands — or rather, for the labels who own their music. I streamed 829 Blink–182 tracks this year so that works out to between $4.15 and $6.63 I personally earned the band. Dashboard Confessional, with 596 streams, got somewhere between $2.98 and $4.77 from me. That’s not as much as either would have got if I’d bought their albums but seeing as I’ll probably listen to them a similar amount next year (and for a long time after), it’s a far more profitable arrangement over the long term. The other interesting thing is that I’m supporting far more artists than ever before — almost 1,600 this year. I’m too young to have ever really bought music The End of Ownership: Netflix, Spotify, and The Streaming Generation The End of Ownership: Netflix, Spotify, and The Streaming Generation Streaming media is convenient, but you're giving up something important: ownership of digital media. Read More but in a hypothetical world where music streaming and piracy didn’t exist there is no way I would ever be paying (however little) to so many artists. With so much data about what people listen to on their hands, Spotify can do some awesome things. 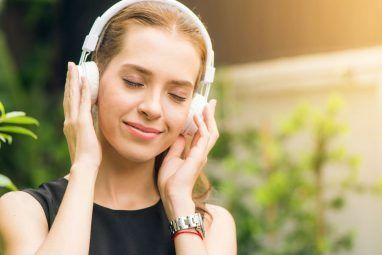 The company is getting incredibly good at predicting Discover New Music with Spotify's Automagic Playlists Discover New Music with Spotify's Automagic Playlists Spotify has recently released several new ways of generating unique playlists that will help you discover awesome new music. We're here to guide you through these automagic playlist makers. Read More what music you’ll like based on what you, and other people like you, listen to on Spotify. Listening to my refreshed Discover Weekly playlist has become a part of my Monday routine. Spotify automatically creates a Play It Forward playlist of tracks from recent albums that you’ve missed. Mine was really good and I’ll definitely be revisiting it over the next few months. Even though I have a (massive) soft spot for early–00s punk-pop I still listen to contemporary music. Spotify’s Year in Review doesn’t just cover you, it covers everyone who used the service. 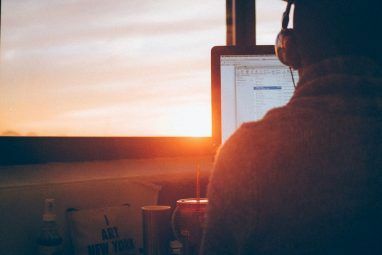 While you don’t get as much information about other people as you do about yourself, you can still find the most played artists, tracks, and albums from across the whole service. If you’re the kind of person who avoids most modern music this works as a really solid guide to what people are listening to right now. It’s worth your while checking it out just to keep an ear on what’s currently popular (Spoiler Alert! : The answer is Drake) even if you don’t like it very much. How Was Your Year in Music? The best thing about apps like Spotify is how personalized they can be. The chances of anyone else having the same top artists as me are practically zero. Your Year in Music is going to look totally different to mine — and that’s where the fun begins. If you check out your Spotify Year in Music (and you aren’t too ashamed of what it reveals about you) share a link to your playlist in the comments below. I would love to check out what each and every MakeUseOf reader has listened to over the past 12 months.